The US dollar will be looking to a string of events today that will no doubt keep the greenback volatile. The two-day FOMC meeting concludes today with the FOMC statement. There is no press conference scheduled for today, and the markets are expecting no changes to the Fed's short-term interest rates. The ADP/Moody's private payrolls numbers will also be coming out today, and after posting a headline print of 263k, economists polled are expecting to see 178k jobs being added in April. The ISM's non-manufacturing PMI is also due for release today with expectations of a slight uptick to 56.1 on the index, up from 55.2 posted last month. 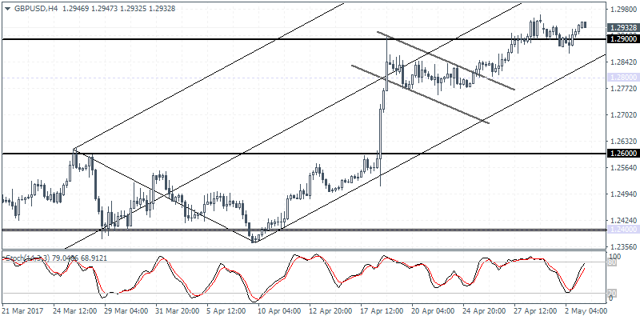 EURUSD (1.0930): EURUSD maintained the gains above 1.0900 yesterday with the daily session closing on a bullish note. Price action is seen testing the previous highs from last week at 1.0930 region but it is unlikely that the common currency will post further gains ahead of the final voting round in France this weekend. Therefore, EURUSD is likely to maintain sideways price action with the potential to slip towards 1.0800 support in the near term. On the 4-hour chart, price action is seen consolidating into a triangle pattern with the immediate support level identified at 10863 - 1.0854. 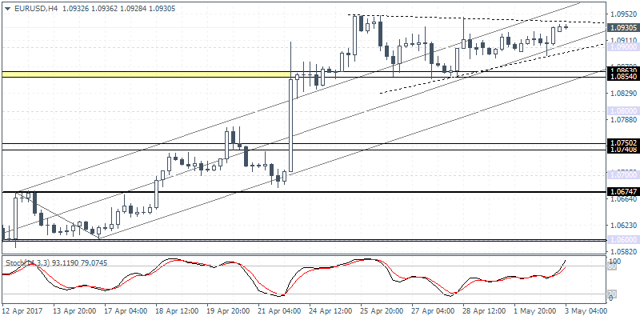 A break down below this support is essential for a test towards 1.0800. GBPUSD (1.2932): The British pound managed to post some gains on the back of a moderately better than expected manufacturing PMI release yesterday. The better than expected manufacturing PMI data managed to keep hopes alive that the UK's economy was resilient despite significant headwinds such as the pending elections in June and the Brexit talks. While the focus will be on today's services PMI release, GBPUSD is seen attempting to fill the gap from last Friday's close at 1.2951. Further gains can be expected only on establishing support at 1.2900 which currently looks to be weak. 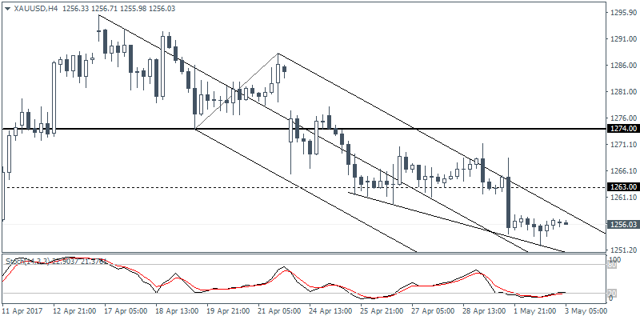 Furthermore, the bearish divergence on the 4-hour chart indicates a possible pullback to as much as 1.2600. XAUUSD (1256.03): Gold prices continued to retreat, but price action was rather muted in yesterday's trading session with prices closing out in a doji, just above the 1250.00 support. With the FOMC meeting due later today, gold prices could be seen coming under pressure as we expect to see a firmer test of support at 1250.00 which will most likely support prices in the near term. To the upside, the short-term resistance is seen at 1258.00 which needs to be breached for a corrective move in gold prices that will see an initial upside gain towards 1263.00 followed by 1274.00.